Bucs sophomore guard Jason Williams is from Detroit, Michigan, where he attended Detroit Allen Academy. He is majoring in sports management. Williams’ mother enjoyed the family-oriented environment and community that ETSU showed when the two came for a school visit. Prior to committing to the Bucs, Williams was a star scoring guard at Detroit Allen Academy. In his sophomore season in high school, Williams averaged 15 points per game along with six assists a game. He followed that up with a huge junior year when he averaged 25 points, six rebounds, six assists and four steals per game. That season Williams was selected on the second team all-state team. He has received other first-team honors. In his senior season, Williams’ scoring numbers dropped a bit when he averaged 17 points per game along with six assists that season. For his three-year starting career, Williams scored over 1,200 points, breaking the school record in his senior season. Coming out of high school Williams was regarded as a top 30 player in the state. Williams models his basketball game after Chris Paul and Kyrie Irving. 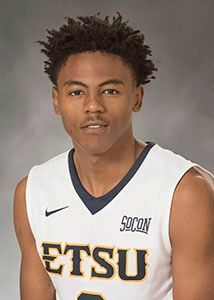 So far in his sophomore season with the Bucs, Williams is shooting over 40 percent from three and has shown flashes of what he can do for the Bucs in the future. The Bucs are on the right track to win the SoCon as they currently have yet to lose a game in conference this season.